The RESTQ-Sport questionnaire measures stress and recovery rates in athletes. Adequate recovery is important to restore the body to the pre-exercise state and prepare for the next bout of exercise. 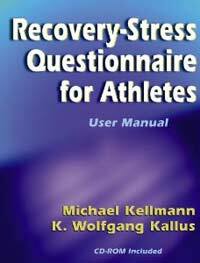 purpose: this tool is for evaluating athlete recovery using a questionnaire. procedure: The RESTQ-Sport questionnaire measures stress and recovery rates in athletes. The manual gives the user the tools needed to measure and track an athlete's recovery. The CD that is also available includes a database and scoring program. You are able to create a database of both individuals and groups. There are two questionnaires (RESTQ-76 and REST-52), scoring keys and profile sheets for the questionnaires. interpretation: the manual provides various examples, in the form of case studies, of how to interpret the data. target groups: This test is suitable for sport participants of all levels. The questionnaire can be used for both applied work and research.